Number one, I know where I am – So I know and I feel where I’m going to start from. I know the place. It’s comfortable, it’s consistent, it’s a ready to launch position, it’s a place where I can feel readiness. It’s not a place where I’m just comfortable being because I’m used to it, but I’m actually ready to attack. Number two, I know where I’m going – I know where contact is, I know where I want the pitch to travel to. You don’t think that the great hitters … Shoot, I can think of, in my day, Kevin Seitzer. He’s a right-handed hitter. He used to hit that 3-4 hole more often than a human being could. Paul Molitor’s spraying the ball all over the place. Great hitters, Wade Boggs and Tony Gwynn and Don Mattingly, Alan Trammel, guys that I played with, they knew different places where they can let the ball travel to and they had a specific place where they knew, and they had a good idea of where it was coming to. They knew where they were going, and they knew how they were going to get there. We need to know where contact is and we need to simplify it in our mind. We need to be in our “launch” position and our “ready” position, and in our “timing” position at the beginning of a timing phase, which we’ll be going into in other sessions. In the “ready” position, it’s not like you’re going to begin in a place where you’re relaxed, where you’re not ready, and then you’re going to have to do a whole lot. No, guys don’t do that. Their first move is they have momentum in that bat. That bat has momentum with them. Even if they have a no-stride, they have momentum. That bat’s ready in the launch phase. They know where they’re going. You know where you’re going, and you know how you’re going to get there. Number three, I don’t waste motion. I direct my energy into the ball. I compress it. I don’t just swing at it. I don’t flail at it like I’m swinging at a piñata. I don’t waste motion. You don’t loop. In other words, you know how to approach the ball. You know how to think about approaching the ball. You know the answers. I didn’t know the answers as the young player. I didn’t understand that, but there are answers for natural hitting. There’s an approach phase, and in the approach phase you want to keep that barrel above your hands so that you can drop the barrel when it’s time. We’ll go into that in some other session. Number four, I’m on time. I’m always on time. Just the simple act of rehearsing, rehearsing gives you a distance. 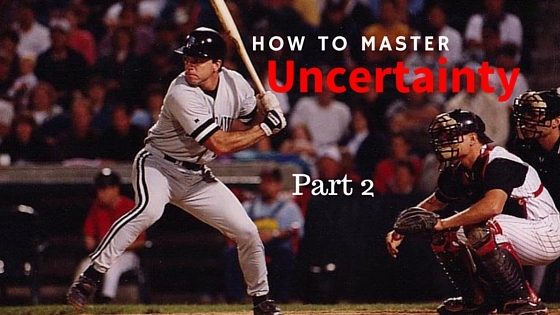 When you take soft toss, you don’t think you feel the distance between release and contact? You feel the distance. That’s why you feel how long the ball’s going to take. Just the simple act, what do we do when we play golf? Shoot, we put the ball down there and we place our club down there. Why do we do that? Why don’t we just hold our club up here? Because we want to know where we’re coming back to. Well, why don’t we do that when we’re hitting? We need to because we need to know where we want to let the ball travel to in the very act of that. We’re going to go into that and I’ll give you more explanations in another session. Hitting is like learning a dance, a bunch of dance steps. The dances flow together. Each of the steps in the dance flow together. Once you learn one thing and then learn the next thing, you have to learn it perfectly one step at a time in a particular order. You don’t learn it sloppy. You learn it perfectly, and then it just goes into a layer and you just go from layer to layer to layer. Pretty soon, it just becomes one thing. It doesn’t become 100 different things. The swing is just one thing. The swing is one movement, one very smooth, on-time, very natural movement. If the very act of rehearsal, knowing where I’m going, deciding where I’m going to let the ball travel to … shoot, if I want to hit that 5-6 hole as a left hander, I know that I’m going to let the ball travel to somewhere in here and I’m going to get comfortable with that. I’m going to work on that. I’m not going to hit the ball way out front and try to guide it over there. I’m going to understand how to let it travel to there, and it takes a certain amount of time for that to get there. All good hitters will tell you that. Number five, I don’t miss. When I got my pitch, I didn’t miss it. I didn’t miss it. I got my pitch, I knew where I was going, I didn’t waste motion, I was on time, and I didn’t miss. You see, you guys, as you’re going through the last part of maybe your regular season in high school, in college, and you’re trying to hang on to your average, keep it simple. Take the pressure off yourself. Just get comfortable with where you’re going to start from. Keep it simple. Then you definitely want to know where you’re going. If you know where you’re going, then you can take the simplest route. Those are the five values that a Major Leaguer has to manifest. He has to manifest these things where he’s going up there, saying, “I know where I am, I know where I’m going, I don’t waste motion, I’m on time, and I don’t miss.” You go up there and you hit with intention, you hit with certainty. Throughout these things I want to give you answers. I want to answer your questions, and so I’m going to remove this for a second and show you a few things. 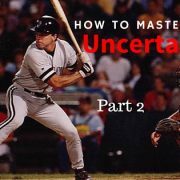 All right, when we’re talking about I know where I am, it’s being in your stance and being so comfortable with your stance that it’s not … Remember, when you first get to pro ball one of the things that you do when you’re a younger player is you think that what allowed you to get a hit is what you did last time. Maybe you did a big wind-up, and so you try to replicate that, when no. What we need to do is get into a place where we’re as close to our launch position as possible so we can eliminate the motion. We eliminate margin for error.